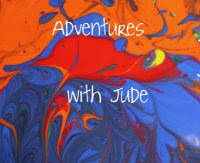 Jude spent the first years of homeschooling bouncing from math program to math program. Some we gave up on because they were a horrible fit for him. while others we stuck with basically out of inertia. 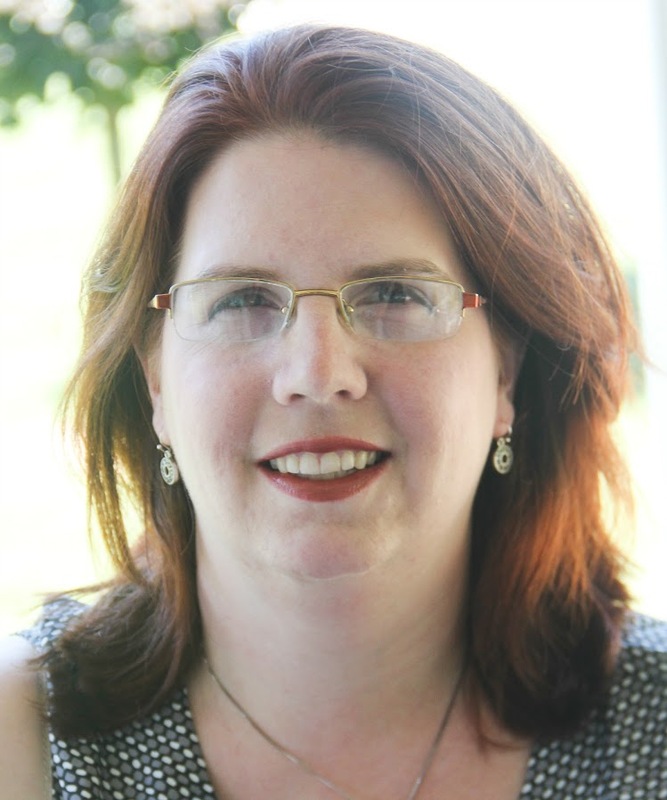 Every time I'd say, "I need to do something about math," my friend Cristi from Through the Calm and Through the Storm would say, "You need to try Math-U-See." She extolls the virtues of it to nearly every homeschooler she meets, and once I finally just listened to her voice of experience we could see why. Most of the programs followed a traditional "grade level" trajectory, with a little of everything, but Math-U-See by Demme Learning sets itself apart by being a concept mastery program. Using their level placement testing, we found Jude was ready for level Gamma. 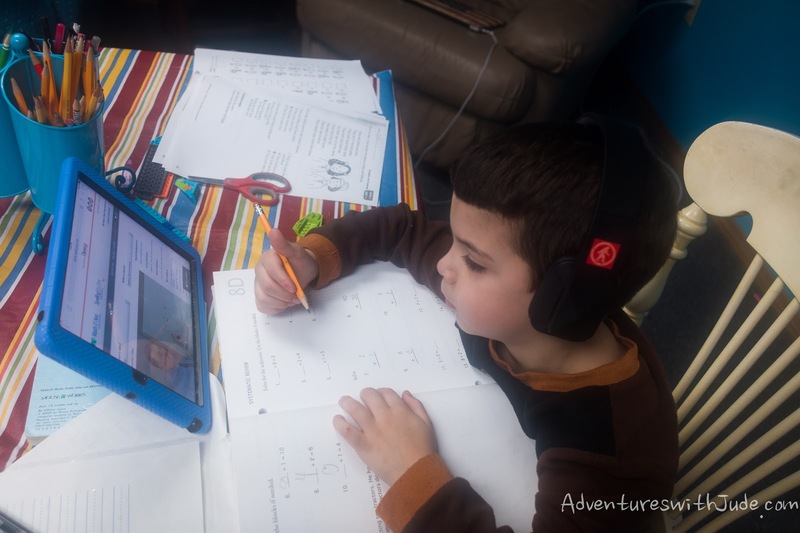 He took to it like the proverbial duck to water, and when Damien started understanding many of Jude's lessons, it seemed a natural fit to start him with Math-U-See as well. Damien began with the Alpha level program, and loves it. However, even though we were already happy converts to the program, we were extremely excited to be part of the Crew team asked to review the Digital Pack program. Digital Manipulatives, using Chrome or Safari browsers. However, the reason for our excitement really could be boiled down to two words: streaming video. There is so much more to the Math-U-See Digital Pack, but I'll be honest, the ability to stream the teaching videos was probably the biggest "Hallelujah" moment of the program, and if it contained nothing but the streaming lessons, I'd be almost just as happy. The package we had already included their DVD instruction program. If you're like us (and really, like most homeschoolers), you do school work pretty much anywhere. Today we might have been at the kitchen table, while yesterday we were on the road and working between doctors' appointments, Tomorrow, if the weather is nice, we'll be outside on the deck. The main issues for us were keeping track of things. It was a constant circus of "Where did the DVD get left? Backpack? Shelf? kitchen table?" and "Where's the DVD player for the laptop? Backpack? Kitchen table? Wait...who had it last? Luke? Matthew?" We could spend half an hour hunting the DVD when it was time to do math lessons, and by the time we were done I'd be swearing I was going to put LoJacks on both items! It also meant Damien was tied to a computer. If Jude was working on something with my laptop, Damien had to wait. When you're in kindergarten, it's hard to wait patiently and still be interested as long as 45 minutes later. Sometimes he'd borrow a laptop from a bigger brother, but they didn't always have the ability to spare theirs right that moment, either. Streaming lessons that work from any browser or device were exactly what we needed. With the Digital Pack, Damien can use his iPad to do his work NOW. No more waiting for somebody to let him have a turn. He hands me his tablet, I log him in as he slips on his earphones, and he's off to work independently. These are the same learning videos that are on the DVD, so he's getting the exact same instruction, just in a more convenient delivery system. Like I said, "HALLELUJAH!" 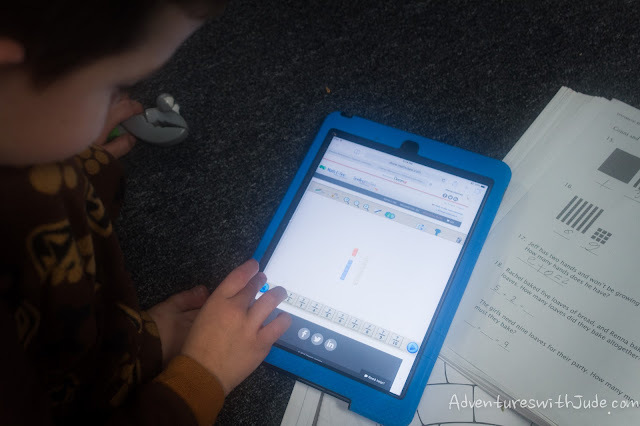 We also liked the idea of the digital manipulatives. A hallmark of Math-U-See's program is its unique manipulative blocks. You can see the numbers (through the color coded blocks) and move them around (great for tactile learners). I was really excited about the idea of digital manipulatives, because the hands-on ones are literally over 100 pieces and just not conducive to dragging with us to duPont. We just really, really struggled with making them work. At first I thought it was just the finickiness of having a touch-screen (using first an iPad and then an iPhone at the hospital), but then we tried them later with a trackpad (laptop) and still had them either stacking atop each other, or the screen sliding around. Maybe there was a secret trick to them, and if we had more patience, we'd have gotten further. We eventually gave up and just went back to the hands-on manipulatives at home, substituting other objects (fingers, ketchup packets, etc.) when on the road. The bonus worksheets were also a plus. Sometimes, Damien just needed a little more practice in something. Sometimes, he just wanted a little more practice, because he thinks Math is fun. With the worksheet creator, you can pick a worksheet from a current lesson, or go back a bit. 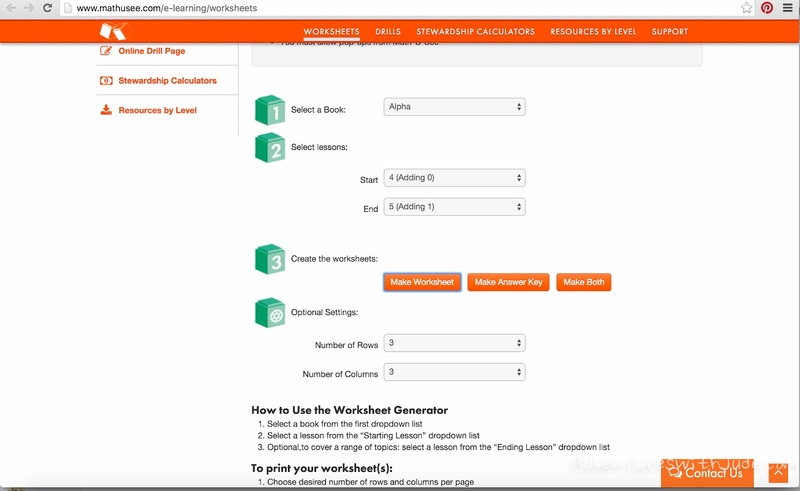 In addition to the worksheets, you will also have access to math drills. Alpha focuses on mastering addition facts and introduces subtraction concepts. Both allow for extra practice that doesn't make math feel overbearing. One days worth of work is only one page - no more than about 10 minutes, so it was nice to have something extra for him to work on for days where he wanted "More math, please!" After less than a year of using the program, we are avid proponents of Math-U-See. Placement is based on skill level, not grade level. Master a concept, move on. Levels are divided according to sequence of concepts, not grade, and use the Greek alphabet to denote the sequence of levels. 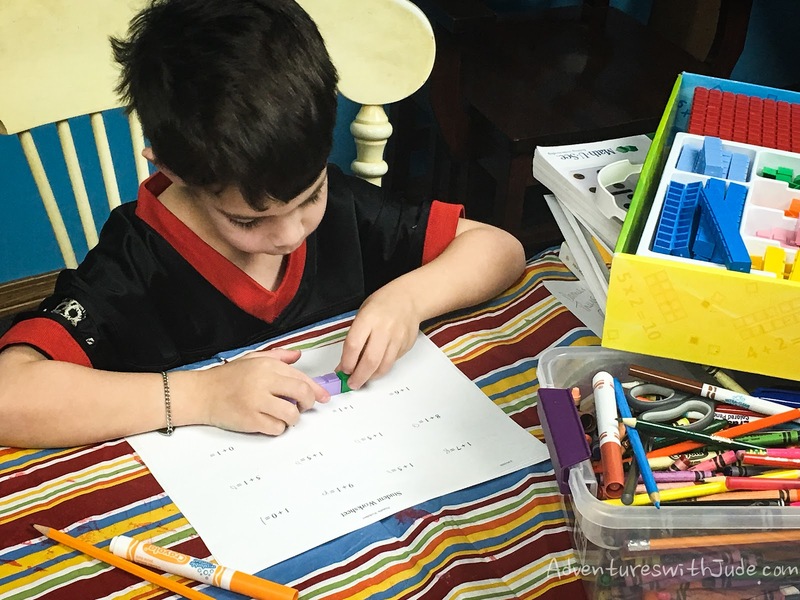 (This makes it wonderful for our family, especially because Jude and Damien are fairly close in learning levels - there's neither "I'm moving up to this grade, and you're not," nor "I guess I'm stupid because I'm only doing that grade math.") Their "see it, touch it, practice it until you master it," suits a variety of learning styles. The only thing that really could have made Math-U-See a better fit for us was having online lessons instead of only on DVD. The Digital Pack checks that off our wish list, and offers us so much more. It's become our new favorite hands-on learning tool! 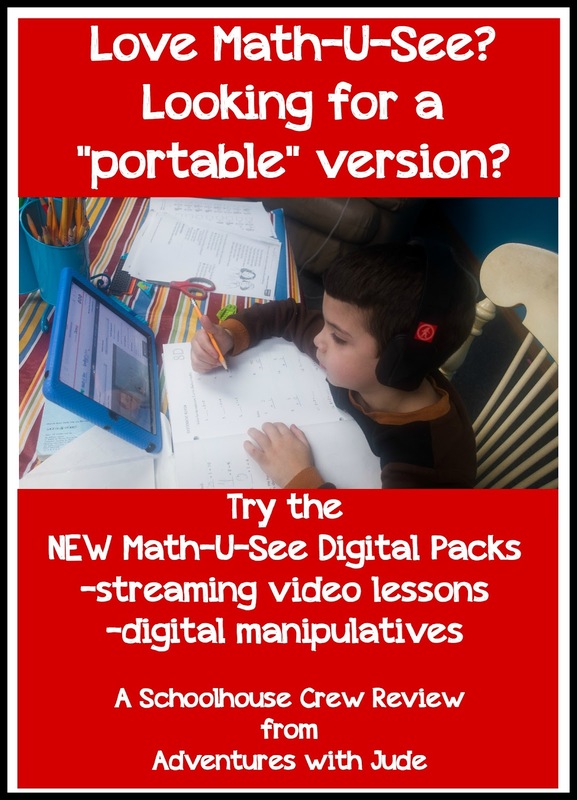 Follow Demme Learning/Math-U-See on social media, or click the banner below to read the Crew Reviews of Math-U-See Digital Packs and core curricula!